Gardening can be addictive. Obsessive gardeners are known to keep the midnight oil burning. 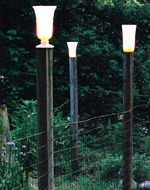 Here are a few fun ways to make easy garden lighting. You should notice that your garden is different world at night, when the insects and moths come out and an occasional bat swoops low and flowers start to emit heavenly scents. You can still appreciate your garden even in the dark. But with a few simple ideas of sight, sound and scent you begin to realize that when one is diminished another is heightened. Hanging jars glisten from above. Instead of recycling your glass hang them from arbors and branches. Knot some twine tightly under the edge of the rim of a jars, leaving long, trailing ends on either side to tie the jar to a tree branch. Fill the jar with sand, rice or bird seed and place a tea candle inside. Replace the lids when done and keep the rain out. Leaf wrapped glasses are fun if temporary. Take a broad leaf and embellish it with a few smaller sprigs. Then tie the arrangement with raffia around a straight sided glass. 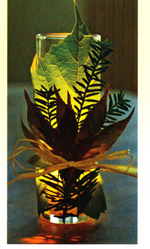 A lighted tea candle inside will show off the structure of the leaves. They will dry out in a few hours but will still look beautiful. Lamp globes generate a sphere of soft light. The large globes from old light fixtures can be balanced on pot feet to create a soft glow ball of light. Face the opening out of sight and slide in a lighted tea candle. 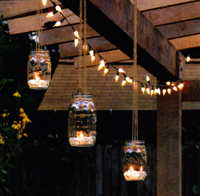 You can also hang small globes from low lying branches for a more polished look than a canopy of jars. Milk glass vases are now inexpensive finds at tag sales and thrift stores. With votive candles inside, they provide beautiful diffused light. Perfect for little spots of light in out of the way nooks, these charmers add an understated glow to the evening. 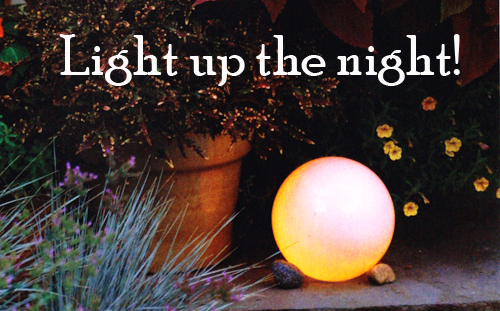 We hope you find a few good tips here and create that glowing garden that is stunning!